Tuesday’s primaries were a big win for women, candidates of color — and moderates, depending on where they ran. Republican Rep. Martha McSally won the GOP Arizona Senate primary, fending off conservative challengers and setting up a high-profile general election fight with Democratic Rep. Kyrsten Sinema. In Florida, a progressive Democrat backed by Sen. Bernie Sanders and a Republican endorsed by President Donald Trump won their respective primaries and will square off in the governor’s race in November. Here are four takeaways from Tuesday’s primaries. After a bruising lead up to primary night, McSally beat out her more conservative opponents in the fight to replace retiring GOP Sen. Jeff Flake. Former state Sen. Kelli Ward and former Maricopa County Sheriff Joe Arpaio, who gained national attention for his hardline immigration views, ran as strong allies of Trump, forcing McSally to at times shift farther right. Although this was a race to fill Flake’s seat, in the backdrop of yesterday’s voting was the recent death of longtime Arizona Sen. John McCain. Ward, who frequently criticized McCain, ended the night nearly 25 points behind the more moderate McSally, a veteran and the first U.S. female fighter pilot to fly in combat. Ward, who frequently criticized McCain, ended the night nearly 25 points behind. Touting centrist credentials was a successful playbook for Sinema, who cruised to victory Tuesday in the state’s Democratic Senate primary. Sinema, considered a moderate Democrat in Washington, spent much of her campaign pointing to her bipartisan record in Congress, while rarely mentioning her own party. Her matchup against McSally is one of the few Senate races this fall in which Democrats have a decent chance of picking up a seat. The big contest of the night in the Sunshine State was the governor’s race. On the Republican side, another Trump-endorsed candidate advanced to the general election in November. Rep. Ron DeSantis easily beat the state’s agriculture commissioner to be the Republican nominee in the race to replace Florida’s Republican Gov. Rick Scott. Scott, who is term-limited, is running for Senate and will face Democratic Sen. Bill Nelson in what is expected to be one of the closest matchups this year. On the Democratic side, progressives made a surprising last-minute surge with Tallahassee Mayor Andrew Gillum picking up the nomination. Gillum has spent most of the primary cycle fourth in the polls. But Tuesday night he managed to beat out his more moderate opponents, including, former Rep. Gwen Graham, the daughter of a former Florida governor. Earlier this month, Gillum won the endorsement of Sanders, I-Vt., who has seen mixed results in backing progressive candidates in this year’s primaries. Florida voters have not elected a Democrat for governor since 1994. In addition to the governor’s race, Democrats are also hoping to pick up House seats in Florida this fall. One of their best shots is the seat of retiring GOP Rep. Ileana Ros-Lehtinen. Former Health and Human Services Secretary Donna Shalala, a Democrat who also served as president of the Clinton Foundation, will face Republican Maria Salazar, a longtime Spanish language television journalist, in the general election for the Miami area district. There will be even more candidates of color on the ballot in November after yesterday’s primaries. In gubernatorial races, Democrats tapped Andrew Gillum in Florida and David Garcia in Arizona. 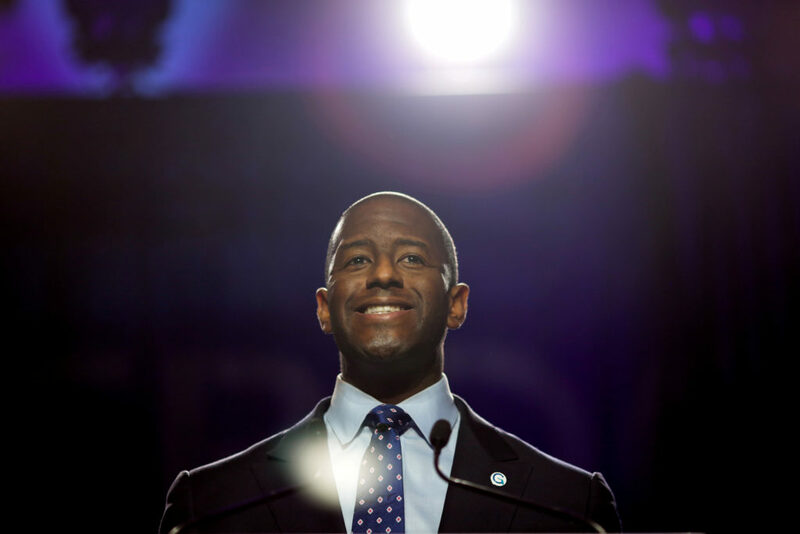 If Gillum manages to win, he would become the first African-American governor of Florida and only the fourth black governor in the U.S. post-Reconstruction. If Garcia wins, he would be the second Latino governor in Arizona’s history. Among candidates for the U.S. House, 14 people of color will be on the ballot in Florida and four in Arizona. This year has already broken the record for the number of female major-party nominees for Congress, according to Rutgers’ Center for American Women and Politics. Last night kept that trend going. Seventeen female candidates for the House advanced to the general election in Florida alone. In Arizona, at least five women won congressional nominations, with potentially more to come as results are still being counted in two races. Among those winners will be the first female U.S. senator from Arizona — either McSally or Sinema, who are facing off in November. Women will also be on ballot in Arizona for attorney general, secretary of state and treasurer.